This is a long-overdue public thank-you to my friend Beth. 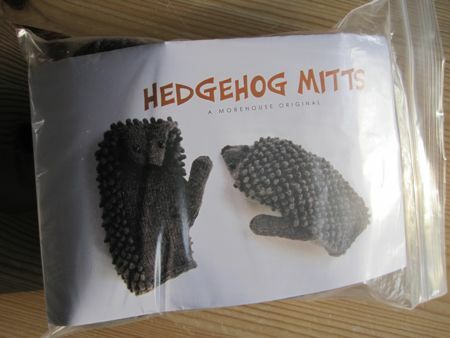 Last January, someone posted to our local knitting group e-mail list a link to Morehouse Farms hedgehog mittens kit. I replied that I loved them but wasn’t planning to spend money on yarn anytime soon. Beth knows that my family loves hedgehogs—especially Sylvia, who has been hedgehog-crazy since she discovered Mrs. Tiggy-winkle when she was two. So Beth did something very sneaky: she bought a kit for me and had it sent to my house. I cast on right away and got to the thumb gusset of the first mitten before I got distracted by other projects. This pattern is fun to knit—albeit a bit slow going (knitting bobbles for the quills takes time! )—and I’m hoping to get a set of these done for myself by next fall . . . and maybe a pair for Sylvia, too! cute! I’m a hedgehog fan myself, would love to see these in action when you get them done. Knitters are such thoughtful folks! These are super-cute mittens! Don’t worry—I will definitely do a follow-up post when these are finished! You’re welcome! I can’t wait to see the finished mittens. Hi! I’m just now working on these too! I got the kit last spring, and when I ran into trouble I stoppped. They are too large for my daughter, not tight at the wrist, so I stopped. Decreased and started again. Still seems too large. How did yours come out? What size did you go with (or how many stitches on the needles when you started). Did they come out loose, and is that okay? I’ve knit much more complicated things than these, but never had this problem before. I did a guage at the beginning so it’s not the size of my stitches.